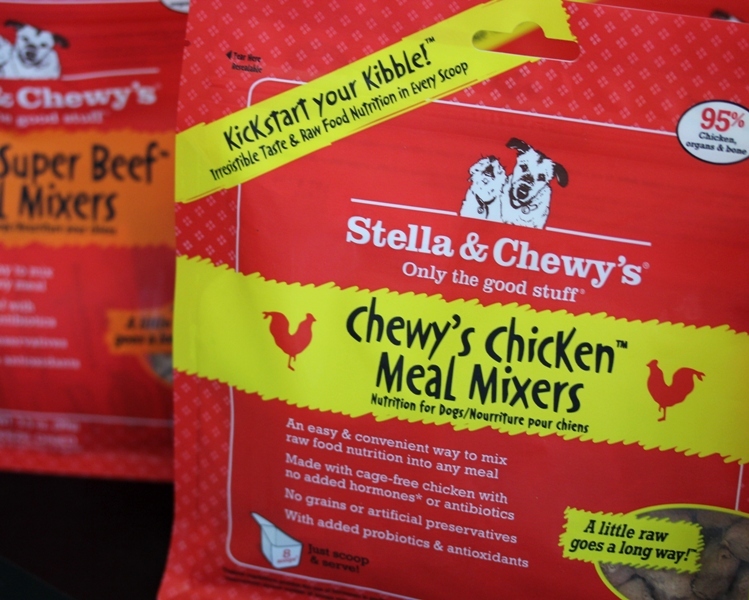 Stella & Chewy’s Meal Mixers are an easy way to add raw food nutrition into any diet. This month, we’ll be talking more about the importance of adding some Raw food to your pet’s diet. Look for future Blog posts about Raw Diets here on our website. Stella & Chewy’s Meal Mixers are a great addition to our selection of Raw products because we know how convenient they’ll be for folks trying out a freeze-dried Raw product for the first time – Just add a scoop (or even half a scoop) to your kibble and Serve! Introducing Raw Food to your pet as treats is another great way to get the much needed natural nutrients and enzymes into your pet’s body. Meal Mixers are small sized pieces perfect for treats! If you have a picky eater at your house, Meal Mixers can get your dogs eating and most will be licking their bowls clean! Is raw food safe? Yes! On every Stella & Chewy’s package, you’ll find a seal that states that the product has gone through their SecureByNature food safety process. Every batch is tested by an independent laboratory for harmful bacteria before packaging. Stella & Chewy’s is so confident in the quality and safety of their products, the test results are posted on their website!